When you need to extra storage on your SD card compatible device, Transcend has the solution! Add extra storage space on your digital camera or cell phone with this 8GB microSD card. If your device requires a standard SD card, you can take advantage of the included adapter. You'll also appreciate the large capacity, which allows you to store your favorite images, music and other personal data and take it along with you wherever you go. For your safety, the microSD card also features a write protection switch, so that you don't accidentally overwrite something important. 8GB Capacity A huge 8GB capacity allows more music, video or data files to be stored in a single SD card – namely about 2000 music files (4mins, 128Kbps, MP3 format) or 2100 image files (8MP, JPEG format, about 3.9MB per file). 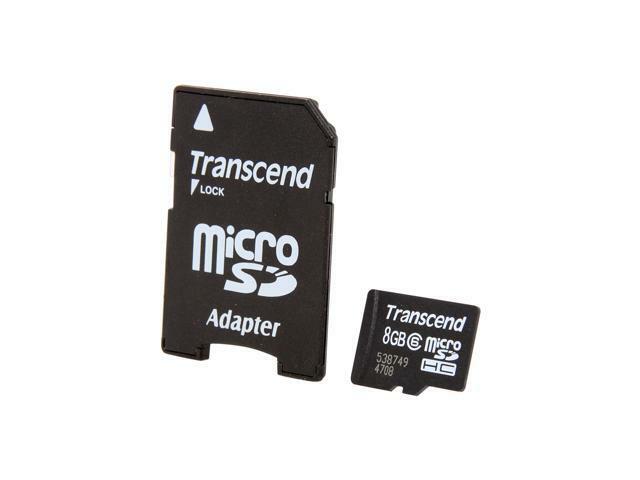 Built-in Error Correcting Code Function The Transcend Micro SDHC flash card comes with the built-in Error Correcting Code for detecting the locations of errors and correcting them during the transfer process. MicroSD Adapter Included Shipped with MicroSD adapter, this MicroSDHC card is allowed to be used in any standard SD card slots, compatible with all SDHC-labeled host devices. Pros: Works perfectly in ZTE Overture phone. Other Thoughts: Bought two for two phones. Card installation and device recognition was quick and uneventful as anticipated. Pros: I've bought multiple Transcend SD cards over time and they always worked great. Got this to replace the one in my camcorder that died. Just ordered the 16 gb version for my new Android phone. It comes with the adapter so I can use standard SD card slot size with my camcorder and laptop, and use the micro without the adapter with my phone. These cards are cheap, but not cheap quality. Cons: Only class 6... but does that really matter? Don't think you're going to notice a difference quite honestly. Class 10 is higher write speed but I'm using this in my camcorder recording 720p video at 60fps and it makes no difference. Maybe it might matter for 1080p at 60fps, but I can't verify that. Other Thoughts: Good SD card, works, and is a great price. Other Thoughts: I bought two of them and I am using them for my Raspberry Pi. Pros: Works as it should. No problems. Pros: Works great with no performance issues. Other Thoughts: Using in an Archos 101 G9 Tablet, greatly increasing storage on the tablet. Pros: got it for a really good price ($6.99) and as soon as i slapped it on the cellphone, it picked it up in like 1 second, decent read/write speeds, came with a Regular size SD adapter and its just perfect. the delivery was fast too. Other Thoughts: i felt remorse, next time im going to get a 32GB one! Pros: I purchased this card ~2 years ago. I've had it in two phones, and it's never missed a beat. I don't know the specs on the classes that well, but I can watch stored 720p videos from it on my Atrix HD. The only mishap was when I accedentally removed it without unmounting and the card was wiped clean, but that was my fault. Pros: No grief, reliable storage. Other Thoughts: I bought this for a neighbor. She purchased a display model camera locally that had no card included. She's happy, I'm happy.